A free public library for Oshkosh was approved by a referendum on May 29, 1895 and opened in a room in City Hall on April 1, 1896. A permanent and fitting home was to be built with a combination of private and public funds. The estate of Mr. and Mrs. Marshall Harris provided the major gift of $75,000. Marshall Harris was a prominent Oshkosh lumberman who died in 1890. His widow, Abbie Danforth Harris, who died June 24, 1895, used her will to create a trust fund for library construction and operation. Its conditions required the community to match the bequest within three years of her death. While private fund-raising efforts elicited the promise of a $25,000 gift from former U.S. Senator Philetus Sawyer, sufficient funds were not forthcoming. The women of the Twentieth Century Club were strong supporters of the effort to obtain political support for a city bond issue. On May 31, 1898, the Oshkosh City Council voted to bond for $50,000 to secure the $75,000 bequest. 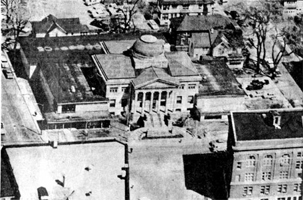 With the proceeds from the sale of the bonds and the contribution from Senator Sawyer, the city met the requirements on June 22, 1898. 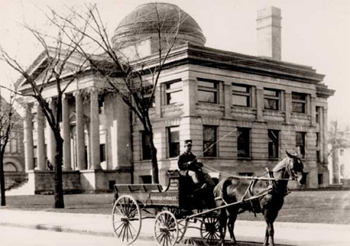 After six months of debate over the merits of plans submitted by three Oshkosh architects, the City Council finally approved the recommendation of the library's board of trustees and its own library committee on December 20, 1898. Well-known local architect William Waters was the choice. William Waters was born in Franklin, Delaware County, New York in 1843. He studied for a time at Rensslaer Polytechnic Institute in Troy, NY before moving to Oshkosh in 1867. Oshkosh was experiencing a building boom due to a series of major fires and the prosperity of the lumber industry. Waters design began with the Oshkosh Normal School (UW-Oshkosh) in 1869. He designed houses, schools, churches, banks, courthouses, stores and public buildings in Oshkosh, the Fox River Valley and Wisconsin. In 1893 he won the commission for the Wisconsin building at the Columbian Exposition in Chicago. He continued his architectual practice in Oshkosh for many years. Waters died December 14, 1917. 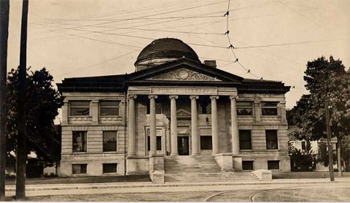 Ground-breaking occurred in the spring of 1899 and the cornerstone was laid in May of 1899. The building opened on Labor Day, September 3, 1900. the opening of the library was extensively covered in the Oshkosh Daily Northwestern. The building is in the Neo-classical style. It features a raised main floor with broad steps from Washington Avenue to a portico with six Ionic columns. The central interior room, originally known as the delivery room, is surmounted by a dome forty-six feet above the floor. The special multi-level bookstack that initially held 30,000 volumes had an ultimate capacity of 100,000 volumes. It is flanked by reading rooms, alcoves and offices that served various functions over the years. 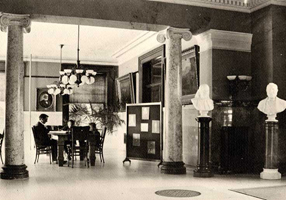 the west room was set aside for children by early in 1901. Initially the second floor was not used for library purposes, being reserved for a lecture room, a museum and future expansion of library services. A museum was opened in the second floor space in 1905. It separated from the library in 1924 and moved to the Edgar Sawyer mansion on Algoma Boulevard, the building it still occupies. The Children's Room was moved to the second floor in 1923. A major change in 1951 was flooring across the rotunda gallery opening and adding a ceiling that closed off the dome. This provided space for a meeting room that could be used for children's programs adjacent to the second floor Children's Room. By the 1960s, the crowding of public and staff and growth of the collection made an addition necessary. The firm of Irion and Reinke designed the contemporary addition to the constraints of site and money available. An L-shaped public space was added to the west and north sides of the Waters building. Only the short south and long west frontage were visible from the street. A stone cladding was chosen for the walls to blend with the original structure. A mezzanine level was matched to that of the main floor of the original structure. A separate section was built on the east side to house a bookmobile and van garage, outreach services and a boiler room. This part was completed in 1967. By the fall of 1968 conversion of the old main floor to a children's department entered from stairs in the new southwest corner lobby was completed along with other changes. 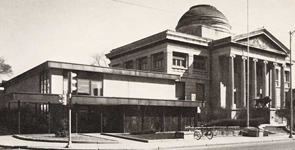 Because of a federal grant under the Library Services and Construction Act, the Wisconsin Library Commission became involved in the project in a basement under the addition. 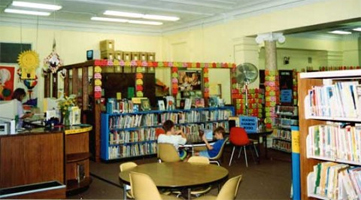 The Winnefox Library System serving Green Lake, Marquette, Waushara and Winnebago Counties came into being in 1977. Fond du Lac County joined in 2000. By 1989 space for collections and public seating was again clearly inadequate. After study of alternatives, the library board decided to expand on the existing site. A referendum to do so at a cost of $8.4 million failed in November of 1990. 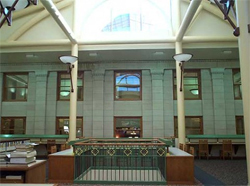 To secure the expansion of the library, representatives of an anonymous donor approached William Frueh, the city manager, in the spring of 1992 to offer a financial contribution. The conditions eventually set for the gift echoed those of the Harris bequest in 1895. The City could claim up to $5.5 million by matching the gift through bonding action of the City Council. The preliminary design budget estimate of $11 million was cut by the Council to $10, forfeiting $500,000 of the offered gift. Another anonymous donor provided $200,000 to offset some of the loss. Through careful management of the gifts and bond proceeds, and deferral of the acquisition of property for parking lot development, the full building envisioned in the preliminary design was built. Final project cost, including the parking lot, came to $10.9 million. 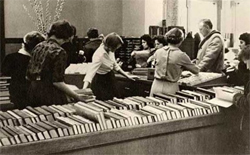 The entire library operation was moved to a city-owned warehouse at 40 Wisconsin Street in February 1993. The former Radford Company facility was used as the library until September 1994. That building was demolished in 2000. The firm of Howard, Needles, Tammen and Bergendoff of Milwaukee, Wisconsin was selected as the project architect. 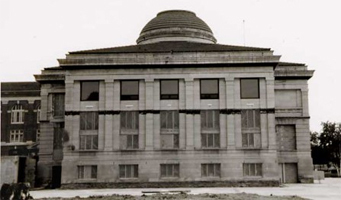 They associated with Frye Gillan Molinaro Architects of Chicago, Illinois, a firm known for sensitive additions to historic library structures. Project manager for HNTB was George Own, AIA. G. Charles Bruscato, AIA, was the project architect. Design architect was Lonn Frye, AIA, of FGMA and Barbara Arendt of FGMA was the design associate. C.R. Meyer was the construction management firm. The design is a U-shaped structure embracing the 1900 Waters building. 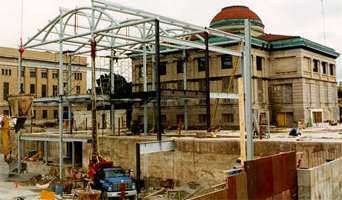 In the spring of 1993 the roof, walls, and mezzanine level of the 1967 addition were removed, revealing the Waters building which was to become one of the focal points of the new design. It incorporates the basement and ground floor of the 1967 addition, most visibly on the lower level where the 'KidSpace' section for younger children uses the north half of the basement. The entire second floor was new construction in 1993, structural columns having been sunk into the 1967 foundation and the overall footprint of the building increased to the north. The new structure is backed off from the Waters building, providing the view of its stone north exterior wall on the first and second floors. 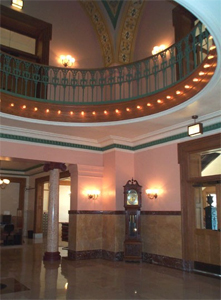 The second floor skylight, a signature of Lonn Frye's work, is centered on the dome of the Waters building. The new and restored library opened in October 1994. After her death in 1996, it was learned that Alberta Kimball, co-founder and retired head of the Miles Kimball Company, had provided the $5 million gift. The information was revealed with the consent of her daughter Mrs. Mary Anhaltzer and her business associate Ted Leyhe who had an active role in arranging her donation. Text from "Architecture and Art of the Oshkosh Public Library: A History and Guide" written by Joan Mueller.